My pup is real food hound so I love creating food themed costumes for him for the various Halloween contests and parades around our city. I decided about 6 months before Halloween that I wanted to try and make a bag of jelly beans costumes. I had seen a kids version online that was just a simple DIY last minute costume where the person stuck balloons in a bag. I wanted to not only transform that idea into a dog costume, but also step it up a notch. One of my favorite parts of making a Halloween costumes is figuring out exactly how I am going to go about doing it. I bought red, blue, and yellow water balloons and all different colors of paint using actual jelly belly jelly beans as my guide for the correct colors. Over the course of about a week, I painted balloons each evening - each balloon required several layers of paint and they had to dry overnight. Once the base colors were painted on, I started painting the various designs using real jelly belly jelly beans as a template. When I was happy with the final product, I covered each balloon with mod podge to make them shiny just like real jelly beans. In total I painted about 60 balloons knowing that some would accidentally get popped or deflated before the costume contests. To make the bag, I cut the bottom off a clear plastic bag, cut out leg holes, and hole punched holes along the bottom and top that I could thread a red ribbon through to keep both ends closed. Its tough to see in the photos, but my dog was completely inside of the garbage bag with only his legs and head sticking out. I then created a hat out of cardboard I shaped to look like a hexagon, red felt, and a piece of the clear plastic garbage bag. Finally, I made a jelly belly logo out of red and yellow felt and printed off generic nutritional facts. 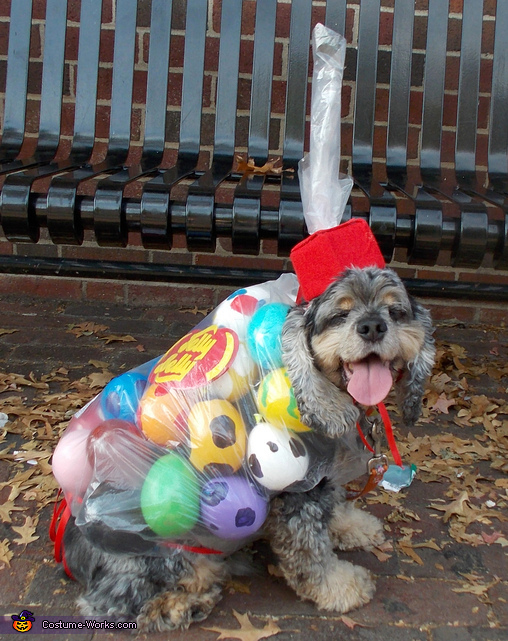 My dog wore this costume to a few events and one of the best parts it that it never looked exactly the same because each time different jelly beans (painted balloons) were on the top. Since making this costume, I still have never seen another dog bag of jelly beans costumes before and couldn't be happier with the way mine turned out. In total this costume didn't cost much to make (about $25) but it did take a lot of time.